Zbirnyk Istorychno-filolohichnoho viddilu VUAN [«Збірник Історично-філологічного відділу ВУАН»; Collection of the Historical-Philological Division of the VUAN]. An irregular serial of research and documents from various fields of Ukrainian studies. In 1921–31 104 issues and 115 volumes were published, including research in the following areas: the historiography and history of Ukraine (Dmytro Bahalii, Mykhailo Hrushevsky, Teoktyst Sushytsky, Volodymyr Shcherbyna, Vasyl Danylevych, Veniiamyn Kordt, Vadym Modzalevsky, Pylyp Klymenko), literature (Volodymyr Naumenko, Volodymyr Riezanov, Mykhailo Markovsky, Serhii Yefremov, Volodymyr Peretts, Hrushevsky, V. Sypovsky, P. Lavrov, Viktor Petrov), linguistics (Olena Kurylo, Yevhen Tymchenko, Vsevolod Hantsov, Petro Buzuk, Volodymyr Rozov), folklore and ethnography (Kateryna Hrushevska, E. Kagarov, Klyment Kvitka, Mykola Levchenko), education (Teodor Titov, O. Savych), art (Hryhorii Pavlutsky), and Oriental studies (Ahatanhel Krymsky). Anniversary collections were dedicated to Bahalii, Hrushevsky, and Mykola Lysenko. 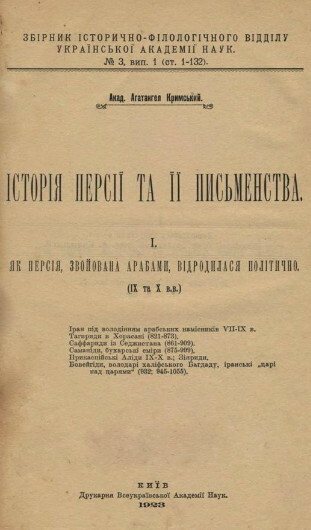 The Zbirnyk ceased publication when the historical-philological division of the All-Ukrainian Academy of Sciences (VUAN) was abolished in 1931.